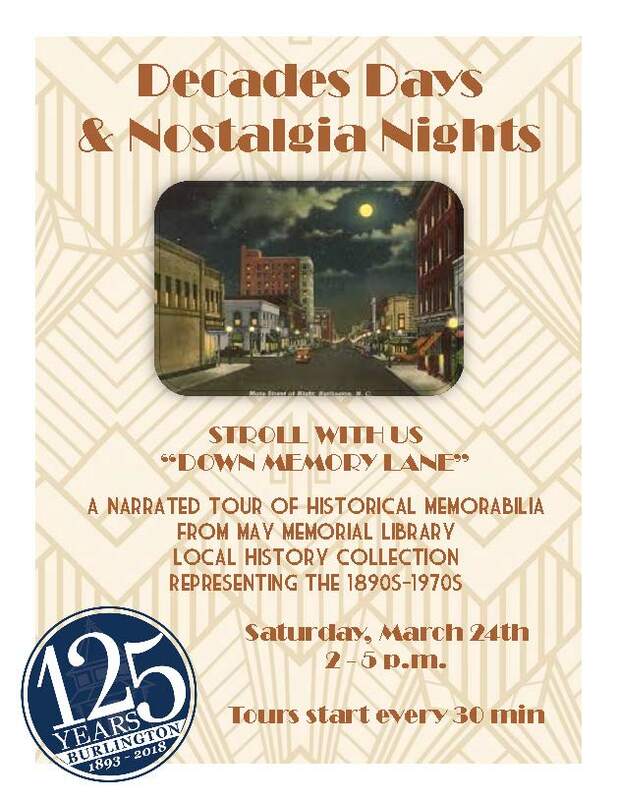 Stroll with May Memorial Library down memory lane in celebration of Burlington’s 125th anniversary. Join them on a narrated tour of historical memorabilia from May Memorial Library’s Local History collection, featuring items representing the1890s-1970s. Tours begin every 30 minutes from 2-4pm on Saturday, March 24. For more information please contact the Local History Librarian at the May Memorial Library: (336) 229-3588 ext. 16130. Bring your Easter basket and join B-town Events in City Park to find goodies left by our Recreation & Parks Easter Bunny. Amusement park rides, cookie decorating, photos with the Easter Bunny, family egg walk, seek & find, entertainment by The Curly Fries & treats by Burlington concessions and Dusty Donuts. 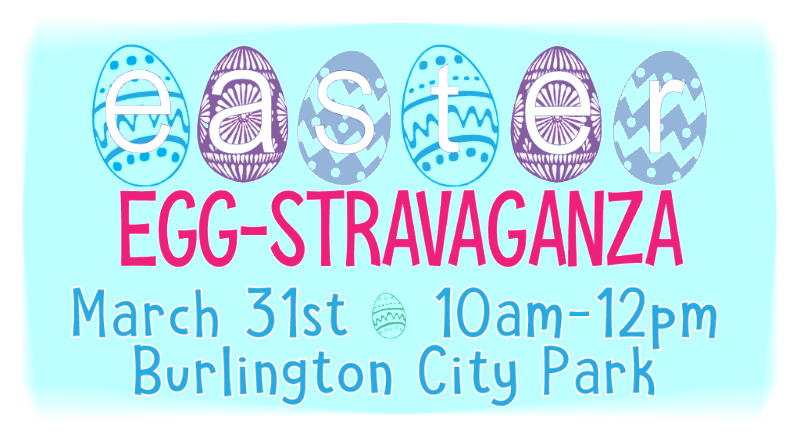 Our Easter Egg-Stravaganza event is free to attend and no registration is necessary. See you at Burlington City Park! Applications to become a member of Burlington’s volunteer Boards and Commissions are currently being accepted. To apply, Burlington residents should complete the application available at www.burlingtonnc.gov/Boards, and then submit it to Burlington’s Public Information Office. City Council will consider applications and make appointments in the month of June. Board and Commission terms begin on July 1st and are typically three years in length. Applicants may submit their application to Public Information Office by email at rkelly@burlingtonNC.gov, in the mail to Attention Rachel Kelly at P.O. Box 1358, Burlington, NC 27216, or in person at 425 South Lexington Avenue in downtown Burlington. Burlington’s volunteer Boards and Commissions perform the important task of advising the City Council about matters including zoning, recreational facilities, preservation of historic sites, and traffic within the City. Boards and Commissions include the Board of Adjustment, Burlington Housing Authority, Tree & Appearance Commission, Minimum Housing Commission, Historic Preservation Commission, Planning and Zoning Commission, Public Transit Advisory Commission, Recreation & Parks Commission, and Traffic Commission. 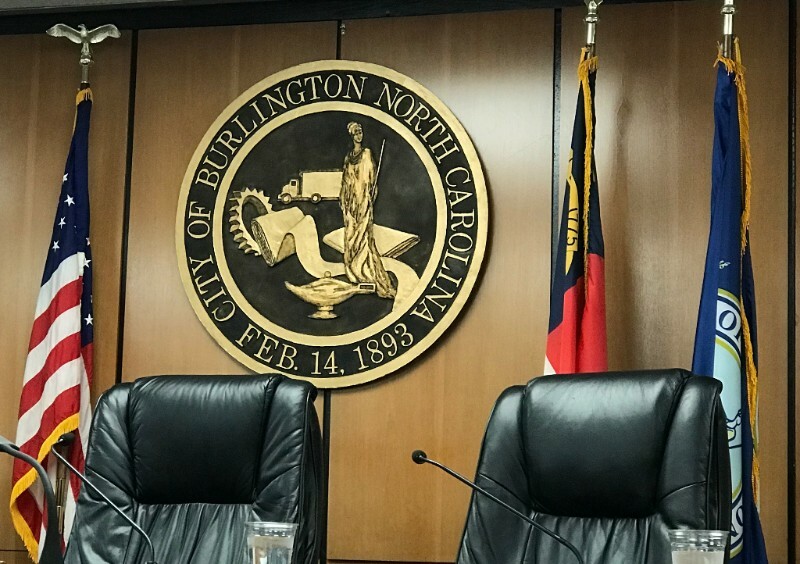 For more information and descriptions of Burlington’s citizen Boards and Commissions as well as information about how to apply, visit www.BurlingtonNC.gov/Boards . The City has waived bulk waste collection fees through April 27. Only residential sanitation customers that currently receive bulk collection services are eligible for this promotion. The normal bulk collection fees are $6.75 per “bite” of the bulk trucks. Pickups for bulk waste occur on Mondays, Tuesdays, Thursdays, and Fridays, and are collected by specially-equipped trucks. Residents must place all bulk waste out one day prior to their normal trash pickup day. Residents must separate bulk waste by category: bulk junk, white goods and metals, bulk yard waste, and televisions. Bulk waste includes items such as mattresses, furniture, rolled carpet, metals, yards waste, bulk limbs, appliances, and televisions that are not able to fit into the resident’s normal, black roll-out container. Items such as scrap tires, lead acid batteries, oyster shells, lumber, building materials, and auto parts will not be collected. 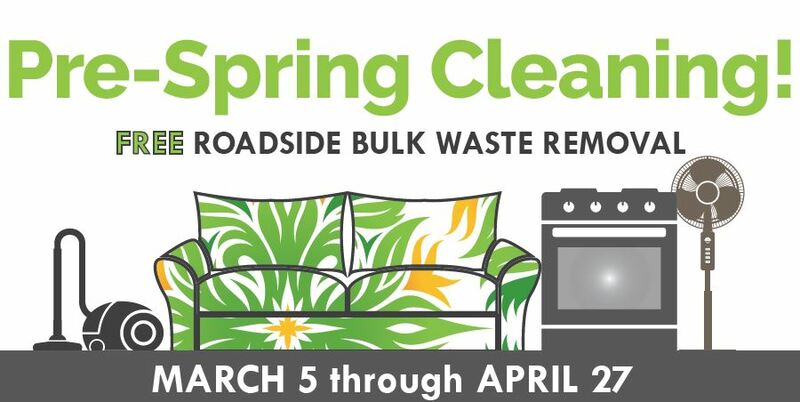 *NEW* Curbside collection of televisions began in 2018! Leave your discarded TVs on the curb on your regular trash day and the City will dispose of it for you. TVs will be collected at no charge through April 2018. A $15 fee, charged to your utility bill, will be applied for curbside collection of a TV beginning in May 2018. 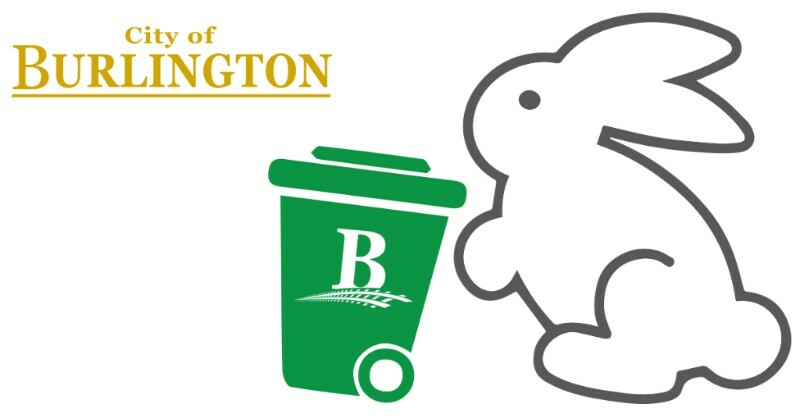 For a full list of what can and cannot be collected, and for more information on Bulk Collection, go to http://www.burlingtonnc.gov/BulkWaste. Questions and concerns may be directed to the Burlington Sanitation Division at 336.222.5111. 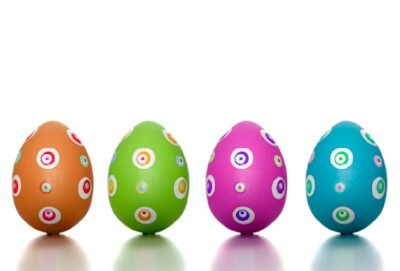 City garbage and recycling collection will be altered due to the Easter holiday. Monday, April 2nd route will be collected on Tuesday, April 3rd. Tuesday route will be collected on Wednesday, April 4th. Thurs. & Fri. routes will remain normal. 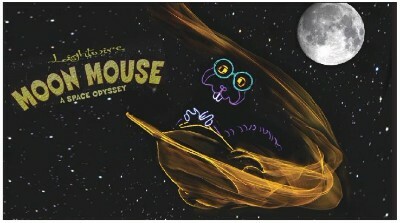 “Moon Mouse”, Lightwire Theater’s “black light/laser special effects, a cosmic adventure about celebrating differences”, is coming to the Paramount Theater, Saturday, March 24. Showtimes for the productions, part of the “Anniversaries Year” celebration of The Paramount, are set for 2PM and 7PM. Marvin the Mouse wants to be popular. Constantly bullied and picked on by the “cool rats”, he is labeled as a loser and a geek. As a respite from the continuous badgering, Marvin retreats into his science books and a world of fantasy. He longs to have adventures and be the hero. He takes the outer space adventure of a lifetime: a trip to the surface of the moon on his homemade rocket, where he meets a string cast of misfit creatures, learns of infinite peril, and views awesome beauty. Will Marvin make his dreams come true and experience the glory and acceptance he craves? Celebrate with Burlington Recreation & Parks at Thataways Youth Center with the whole family! 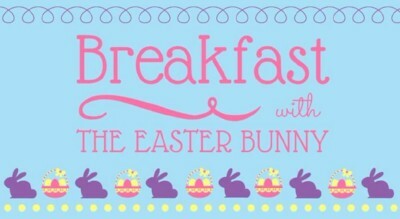 The event includes breakfast, arts & crafts, and face painting. Breakfast will include coffee, orange juice, biscuit and fruit. The Burlington Youth Council will have a bake sale table to support local community projects. Don’t forget your camera to take a picture with the Easter Bunny! Tickets sales have been ***EXTENDED*** until March 21. Pre-registration is required. NO WALK-INS ON DAY OF EVENT! Space is limited. For more information, please call (336) 222-5134. The Burlington City Park amusement rides will open on Good Friday, March 30th from 10:00am – 7:00pm, weather permitting. Bring your family out to City Park and start a tradition! Rides include the train, planes, boats, and cars. The Amusement Rides will also be open regular hours that weekend, but will be closed on Easter Monday. 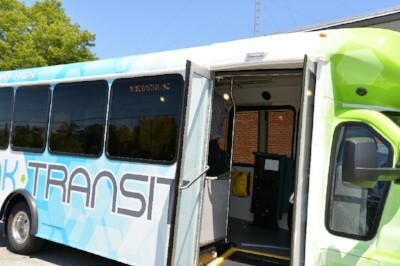 For more information to plan your trip, including fees and ride guidelines at City Park, please visit www.BurlingtonNC.gov/citypark. 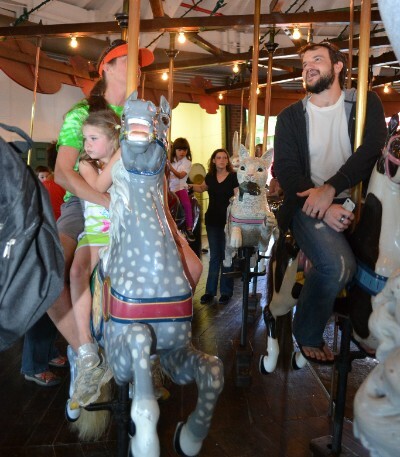 Please note the Carousel is currently closed for renovations. Link Transit will continue normal operations on Good Friday, March 30, 2018. Administrative offices will be closed, but buses will operate during regular hours on regular routes. Copyright © 2016 City of Burlington, All rights reserved. You are receiving this email because of your involvement with the City of Burlington.